The great thing about having a keypad lock like the Schlage Connect is that you don’t need physical keys at all. Instead, you just enter in a key code (aka user codes) and you’re off to the races. 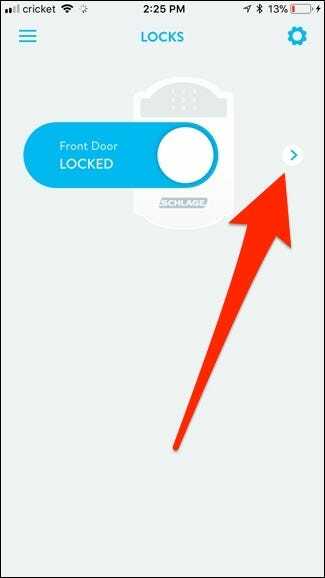 Here’s how to create and manage key codes for the Schlage Connect smart lock, both on the lock itself and on your phone. Before we begin, you’ll need to know your lock’s programming code, which can be found on the back of the interior portion of the unit. You should have jotted it down before installing the lock in the first place, but if not, you’ll need to take it apart and write down the programming code. This is required to put the lock into programming mode, which allows you to change and manage the lock’s settings. The Schlage Connect comes with a couple of default codes out of the box, but it’s best to come up with your own code to use. To get started, open your door and extend the deadbolt so that it’s in the locked position (you’ll begin all programming this way). From there, press down on the Schlage button at the top of the keypad and then enter in your six-digit programming code (again, you’ll begin all programming this way). If successful, the green checkmark will blink twice and you’ll also hear two beeps. If you get a red X, press the Schlage button to start over. 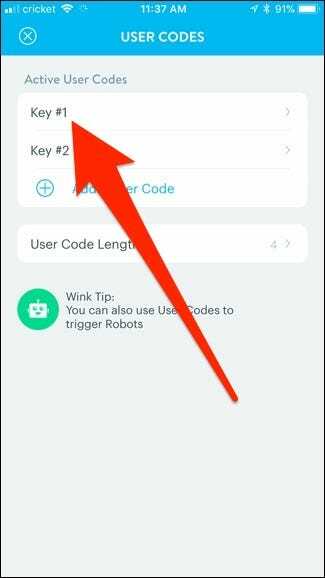 To add a user code using your phone, you’ll first need to connect the smart lock to a smarthome hub. In my case, I’m using the Wink Hub 2 along with the Wink app. Take a look at our setup guide on how to do this. You can use a different hub, and it should follow a somewhat similar process. Select your lock in the app and then tap on the arrow off to the right. 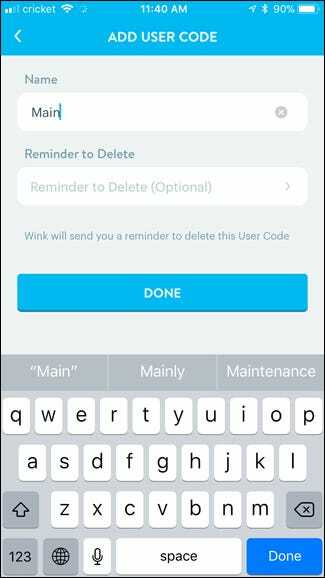 You may need to enter in your Wink password before continuing, but once that’s done, you’ll get to the User Codes screen. 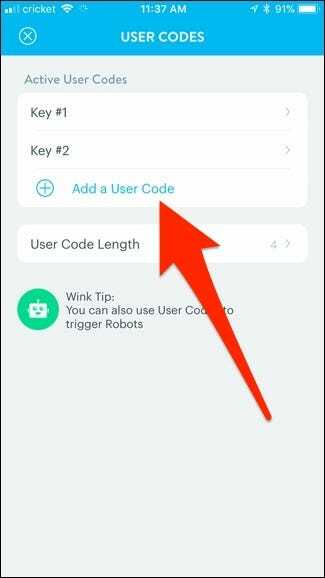 Tap on “Add a User Code”. Type in the new user code. You’ll need to enter in twice to confirm. After that, give the user code a name, as well as a reminder if you ever need to delete it in the near future. Then hit “Done”. To delete a user code on the lock itself, press the Schlage button followed by the programming code, and then hit “2”. After that, enter in the user code that you want to delete twice. If successful, you’ll get a blinking green checkmark and two beeps. You can also delete all user codes at once by pressing the Schlage button, entering in the programming code, pressing “6”, and then entering in the programming code again. This will prevent you from unlocking your door with a user code (since there are none) until you create a new user code. 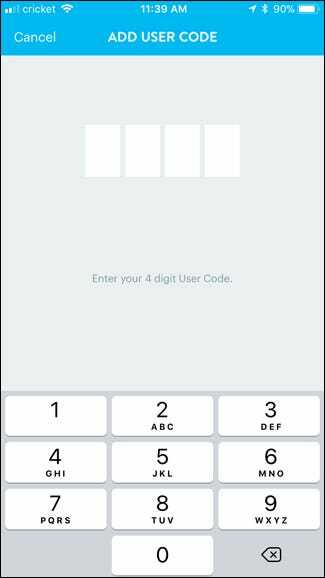 To delete a user code on your phone, tap on the arrow off to the right to access the lock’s user codes. 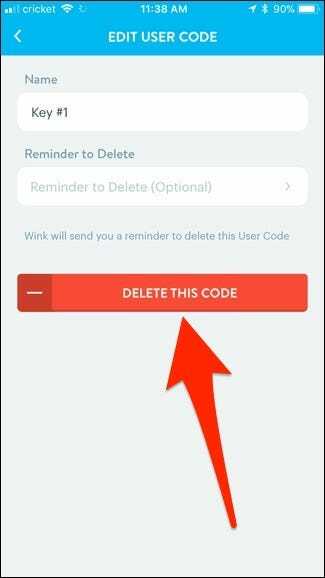 From there, tap on the user code that you want to delete. Then tap “Delete This Code”. The Schlage Connect allows you to use anywhere from four-digit user codes up to eight-digit user codes. Keep in mind, though, that changing the user code length will also erase all current user codes, so you’ll have to create new codes after you do this. To change the length, press the Schlage button, enter in the programming code followed by “8”, and then hit the number on the keypad that corresponds to the length you want to use (you’ll press this number twice). So if you want six-digit user codes, you’ll press 66. If successful, you’ll get a blinking green checkmark and two beeps. 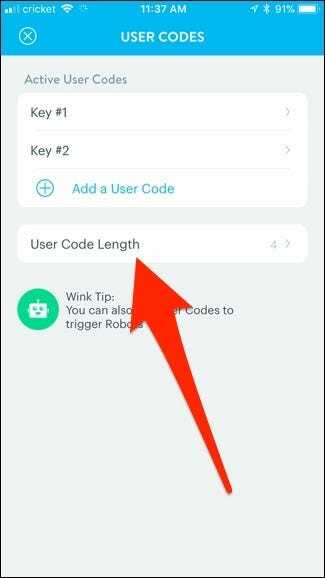 To change the user code length on your phone, tap on the arrow off to the right to access the lock’s user codes and select “User Code Length”. 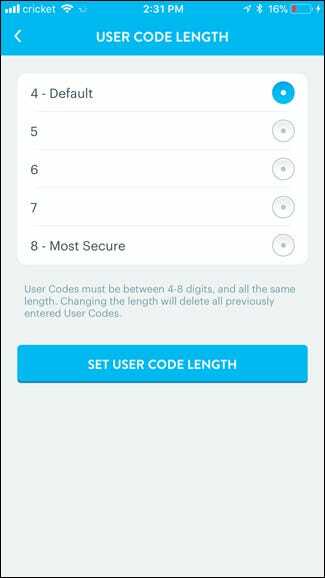 Select a number between four and eight and then tap on “Set User Code Length”. Remember, this will delete all current user codes, so you’ll need to go back and create new ones when you do this.